​In 40 years of regular visits to Japan, I’ve seen much of the country, but last summer I had the good fortune to explore an area I’d never visited before: Oita prefecture on Kyushu, the southernmost of Japan’s four principal islands. Oita is located in northeastern Kyushu, and is bordered by the mountains of Kumamoto and Fukuoka prefectures on the west and the Seto Inland Sea on the east. Over five days of touring, I discovered that Oita offers bucolic landscapes, beguiling villages, and a surprisingly rich repository of historical and cultural treasures. It also has deep connections to the Western world. The Jesuit missionary Sir Francis Xavier traveled in Oita when he brought Christianity to Japan in the mid-16th century (and converted thousands of Japanese, including a powerful feudal lord named Sorin Otomo), and William Adams, the English sailor who became a samurai (and inspired James Clavell’s Shogun), first landed in Oita in 1600. This autumn the world will be coming to Oita again in the form of the Rugby World Cup, the third largest sports event after the Summer Olympics and the Football World Cup. And next summer, visitors to the Tokyo Olympics may well want to add a delightful detour here to their travel plans. 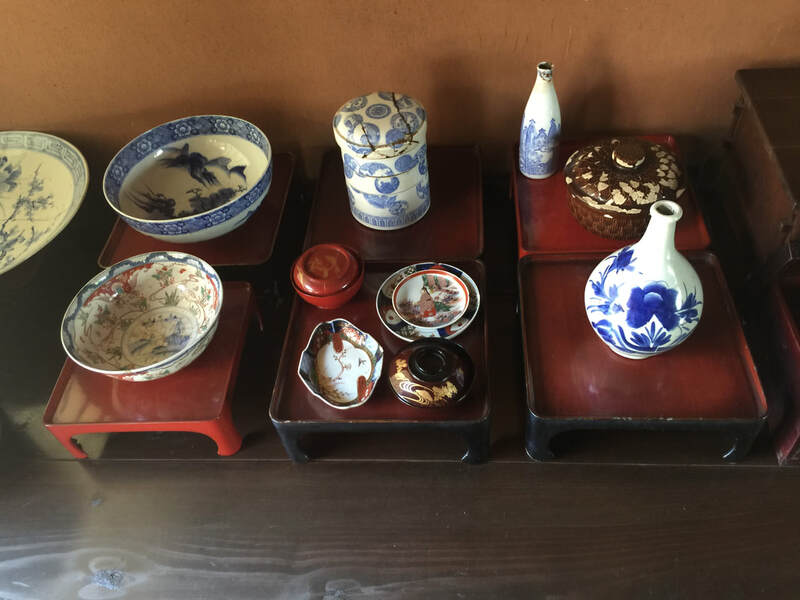 This article will describe some of the surprises and splendors that await these visitors – and all other foreigners who venture to Oita. The resort town of Beppu is Oita’s most famous destination. 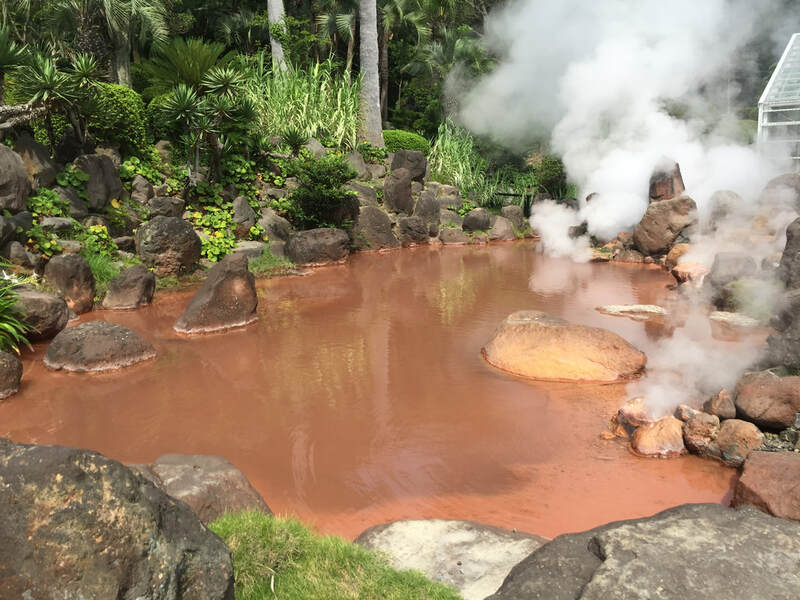 Often called the hot spring capital of Japan, Beppu has the greatest concentration of hot springs in the country. It’s especially famous among domestic visitors for its jigoku, or literally, hells. Some of the most famous hells include the cobalt blue Umi Jigoku (Sea Hell), the deep red Chinoike Jigoku (Blood Pond Hell), and geysering Tatsumaki Jigoku (Waterspout Hell). It’s almost otherworldly to wander among these steaming pools of water that regularly bubble, spew, and spout. 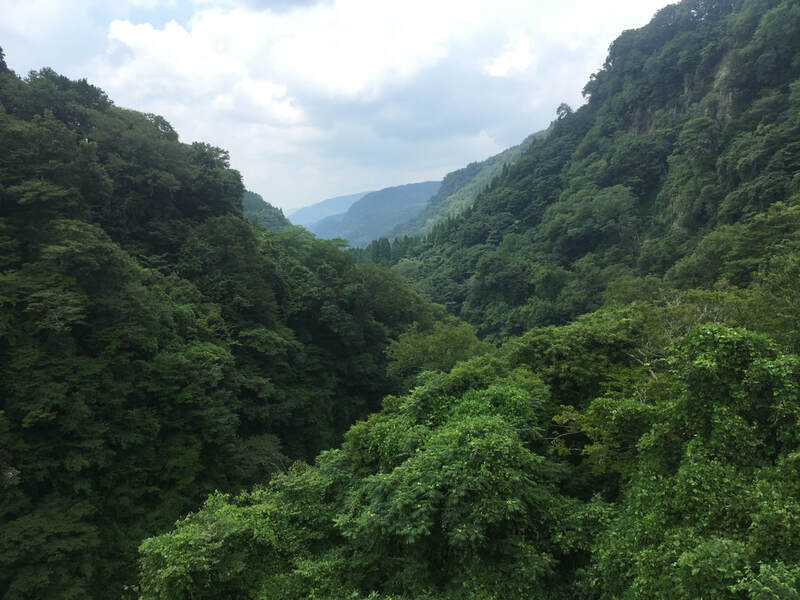 To get a sense of just how pervasive the springs are, it’s enlightening to visit the Yuikemuri Tenbodai Observation point, where you can see steam-plumes rising simultaneously from dozens of spots throughout the city, vivid evidence of the hot streams that course ceaselessly under the area. 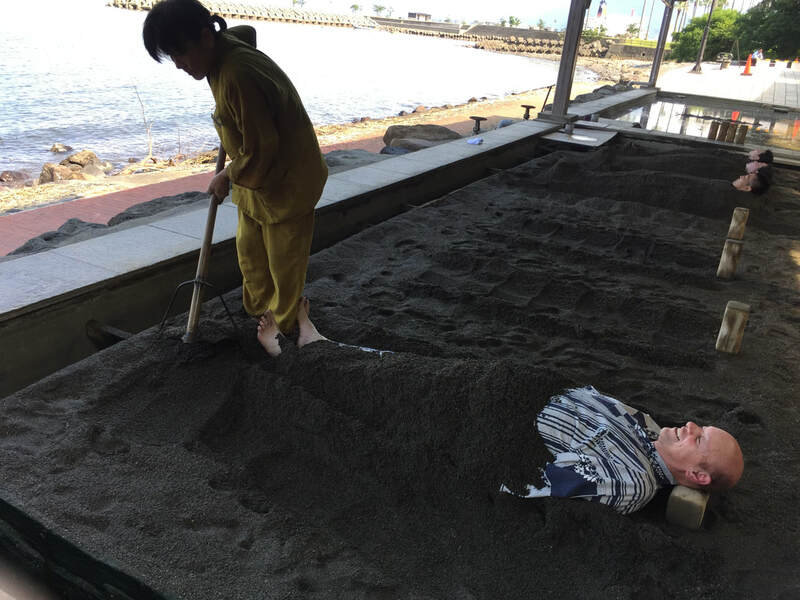 The hot springs are a remarkable sight, but for me, the most memorable part of my visit to Beppu was an immersion in a hot sand bath. For this delight I went to the Beppu Hot Sand Bath facility, an unprepossessing building located in a beautiful setting right on Shoningahama Beach, looking onto Beppu Bay, beside a grove of pine trees. First I changed into a yukata, a light cotton wraparound robe. Then I was led to a rectangular area about the size of half a tennis court, where fourteen foot-high mounds of sand were arranged in two neat rows. 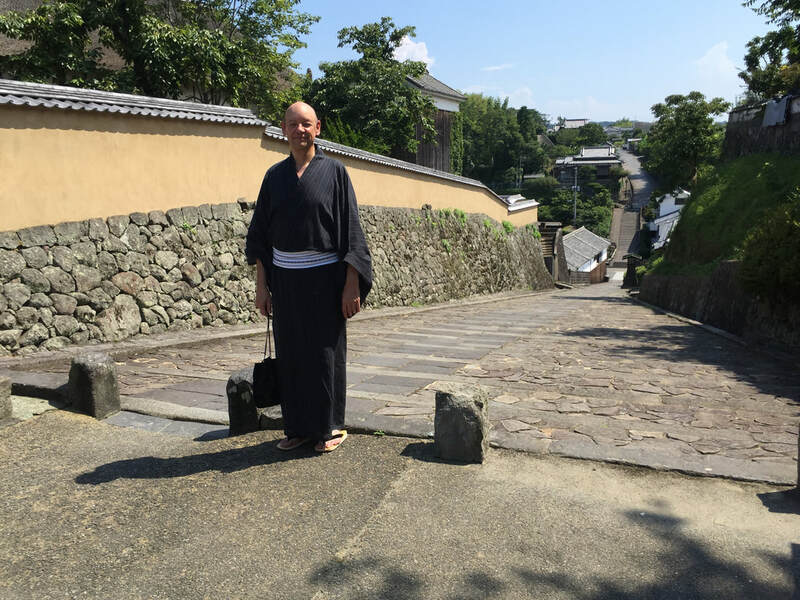 I was led to a spot at the far end of the front row and told to lie down, still clothed in my yukata, in a slight indentation that had been prepared next to the mound, with a wooden neck-rest placed at one end. 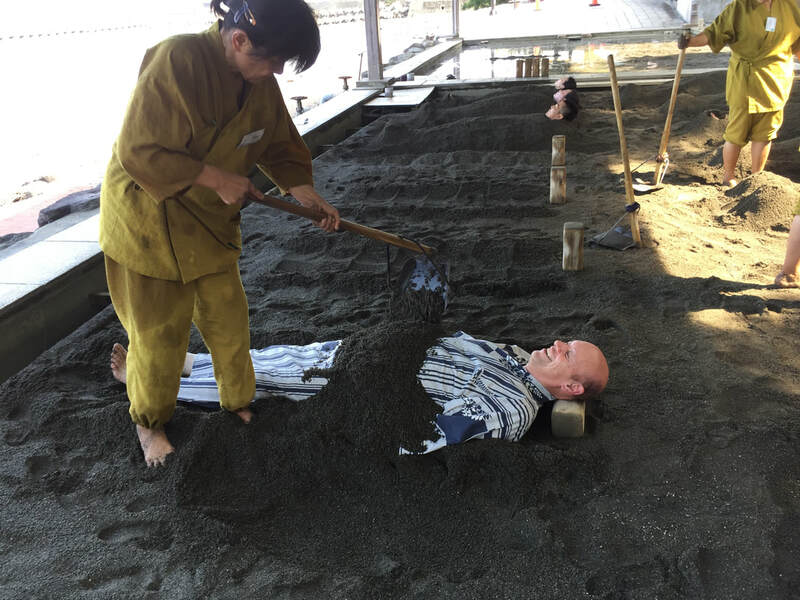 After I lay down, the smiling attendant took a special shovel-like tool and gently began to cover me with the sand, starting with my midsection and then working down to my feet. Heated by hot spring waters rich in sodium-hydrogen carbonate, the black volcanic sand is said to cure a host of bodily ailments and confer a general sense of well-being. 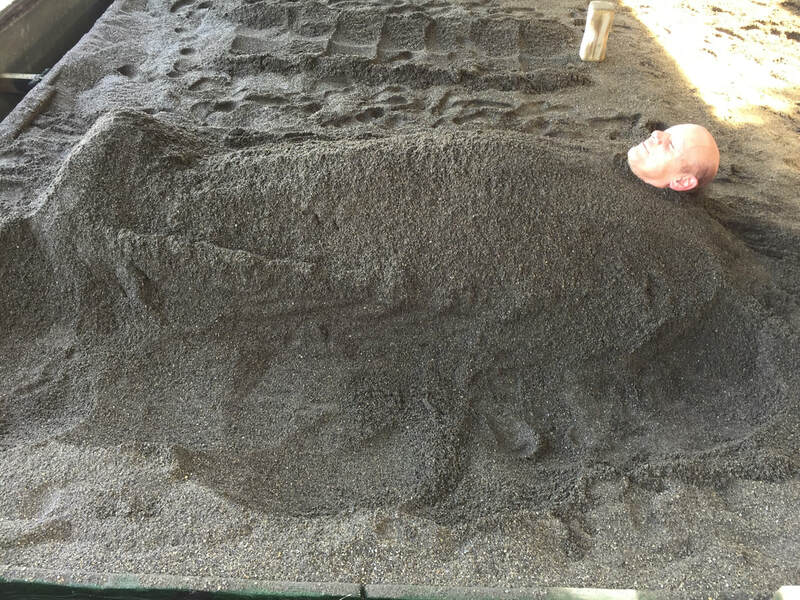 The sand was definitely warm but not over-hot, and at first the sensation was pleasantly reminiscent of childhood trips to the beach, when I and my friends would playfully bury each other in the sand. As the attendant finished covering my feet and moved up to my chest, the sand felt like a grainy swaddling blanket. Then, as he covered my upper arms and shoulders, the pressure became a bit uncomfortable. When I was fully covered up to my chin, I actually felt some panic. With my arms pinned to my sides under layers of sand, I was suddenly aware of just how vulnerable I was. If a fly landed on my nose, I would be powerless to swat it. If a squirrel squatted on my head, I would just have to endure it. ​It was at once uncomfortable and illuminating to feel so publicly vulnerable and reliant on the kindly attendant, who at that moment had wandered off – where had he wandered off to anyway? Very soon thereafter he returned and asked if I was OK and said he would dig me out after 15 minutes, and that he would be within earshot if I needed anything before then. After that, something almost magical happened: I took some deep breaths, and concentrated on feeling the warm weight of the swaddling sand. I breathed in, breathed out; breathed in, breathed out. I looked at the green pines to my left, and the blue sea and sky before me. And then I let go. I abandoned myself to the sand, the swishing sound of the breeze in the pines, the faint smell of pine on the breeze, the warmth of the sand, the warm weight of it, penetrating to my bones, the susurration of the sea, the ceaseless caress of the pine-perfumed breeze. The sand warmed through me, all the way to my soul. And then I closed my eyes. Suddenly the attendant was standing over me. “It’s time to dig you out now,” he said. He gently removed the sand and when he was done, I stood up, feeling suddenly light and lightheaded, and shook myself like a dog shedding water. Then I walked slowly back to the facility’s shower, astonished at how new everything looked and felt. Washing off every speck of sand in the shower felt wonderful. The cold beer I savored at a table on the beach afterward felt even more wonderful. Oita is home to a number of former castle towns, such as Taketa and Hiji. The one that particularly caught my attention is Kitsuki. Partly this is because its castle is considered the smallest in Japan, and partly because the layout of the town is unique, with the samurai districts on two hills to the north and south, and the merchant district sandwiched between them – a feature that has prompted some to call Kitsuki “the sandwich town.” But in truth I was mostly attracted to Kitsuki because it is also known as Kyushu’s Little Kyoto, and I had read that visitors can rent a kimono and stroll among the former samurai houses and present-day shops in traditional garb. 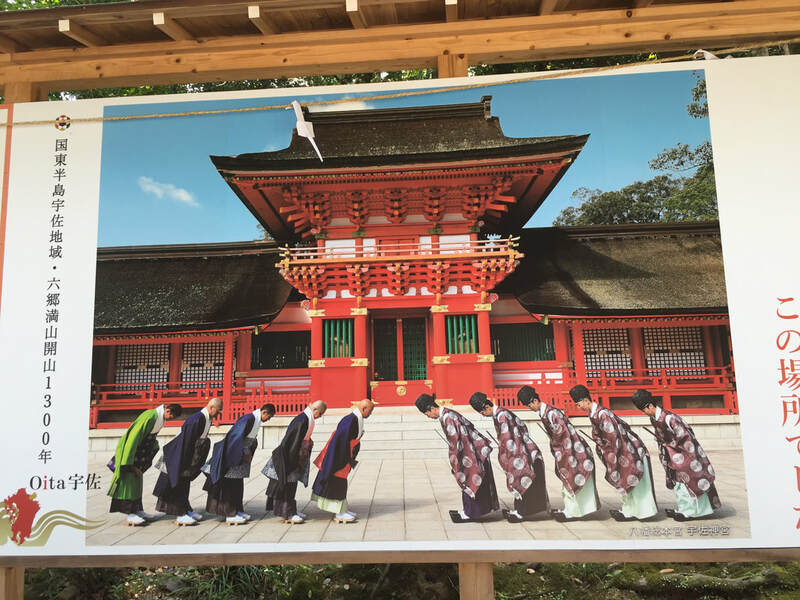 You can do this in Kyoto too, but there you will be elbow-to-elbow with hundreds or even thousands of other kimono-clad sightseers. 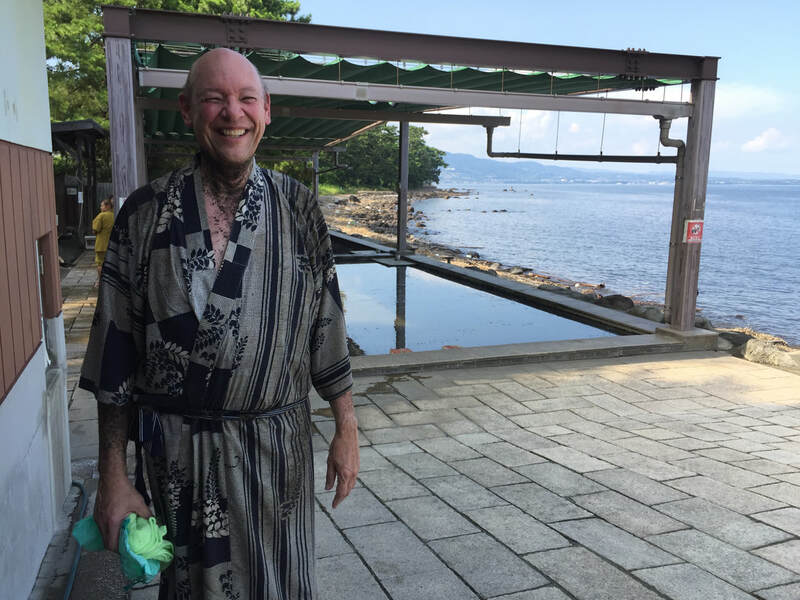 Quite to the contrary, on the day I visited Kitsuki, I was the only customer in the kimono rental shop, and in my wanderings, I encountered less than a dozen other tourists. This lack of crowds, combined with the town’s dedication to keeping its historic areas free of visible power lines and any other manifestations of modernity, profoundly enhanced my time-travel experience. 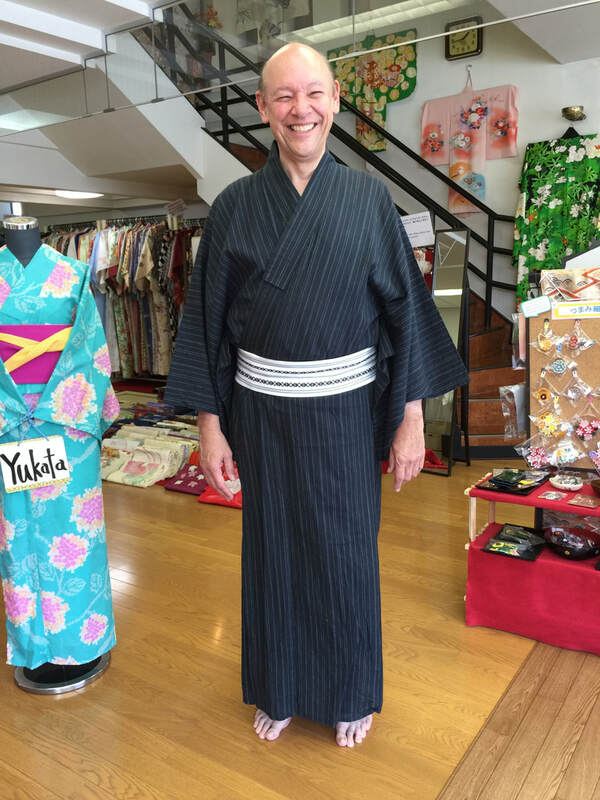 I began my visit at the Warakuan kimono rental shop, where the kindly proprietor allowed me to take my time selecting a summer kimono from dozens of choices, then helped me to correctly put on the layers of under-robes and outer robes and the encircling obi. ​Then, outfitted as authentically as I could ever be, I passed the next hour and a half ambling through the streets of Kitsuki, imagining myself a visiting nineteenth-century nobleman. 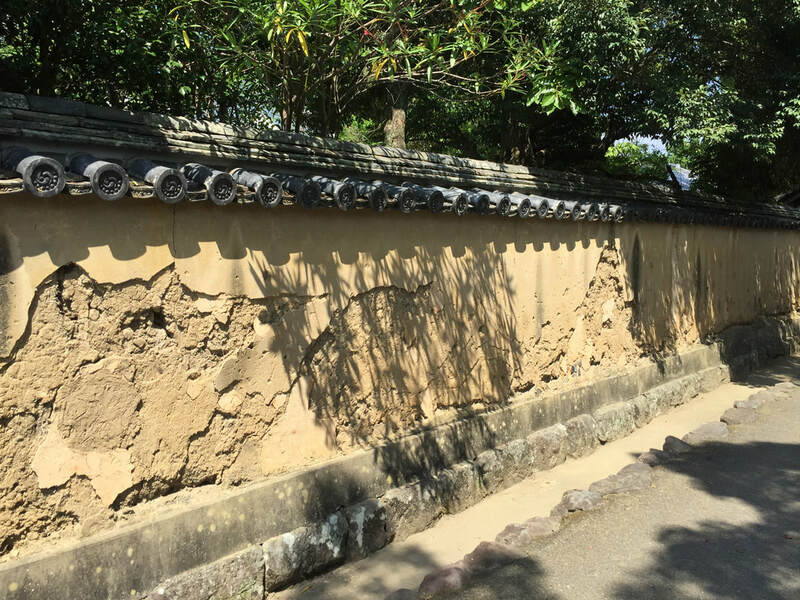 I concentrated my visit on the Kitadai northern bukeyashiki, or samurai district, where a peaceful street framed by high earthen walls and shading trees passes three stately former samurai residences, as well as a building that was used as a school for children of the samurai. All the buildings were resonant and revealing, but my favorite was the Ohara-Tei, the former residence of the Ohara family, who were the chief retainers of the local Matsudaira feudal lord. With its impressive thatched roof and sprawling strolling garden, this is considered the finest samurai residence in Kitsuki. The interior rooms were immaculately presented. 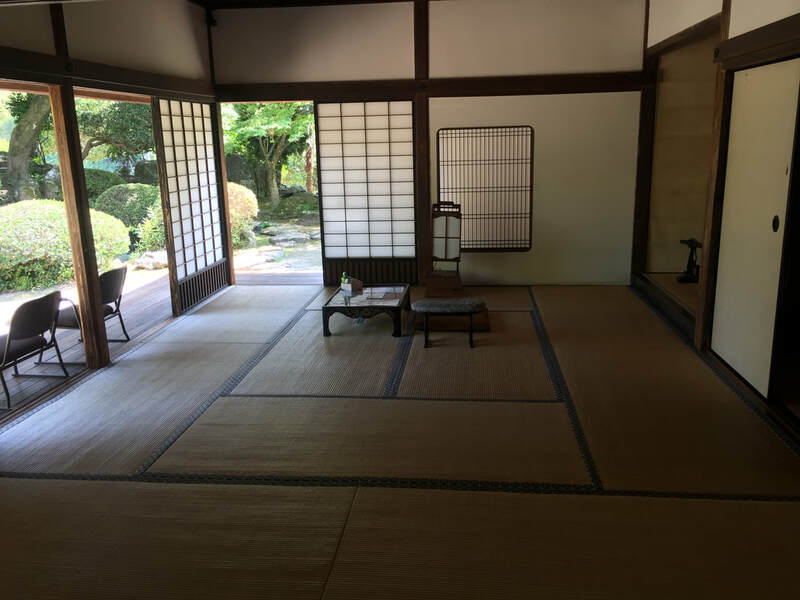 The living and sleeping quarters were expansive, tatami-matted rooms with elegant sliding fusama panels and shoji screen doors, hanging scrolls, artfully arranged flowers, and rice paper wooden lanterns; one room even had an actual samurai sword that visitors were allowed to hold and heft. 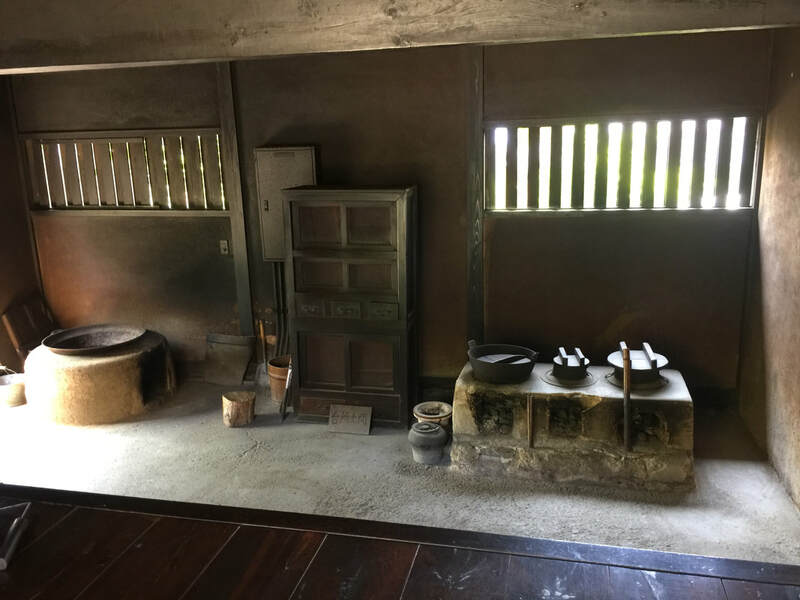 There was a bathing area with a wooden tub, a kitchen with nabe cooking pots, and an eating area with ceramic and lacquer bowls and sake bottles. The garden featured stone lanterns, dozens of trees, and a placid pool with bright water lilies and lazily swimming carp. 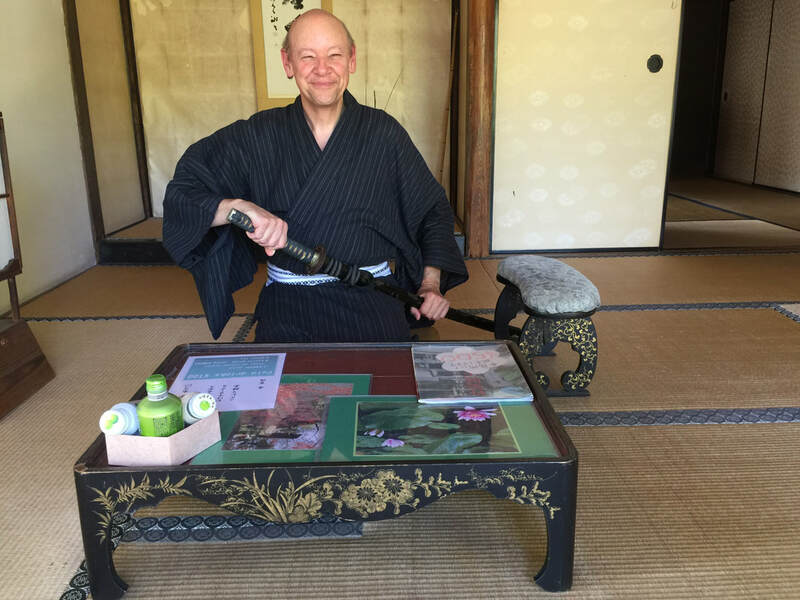 All in all, the Ohara-Tei offered an excellent sense of everyday life for a high-ranking samurai in the nineteenth century – and in my kimono, I felt right at home. 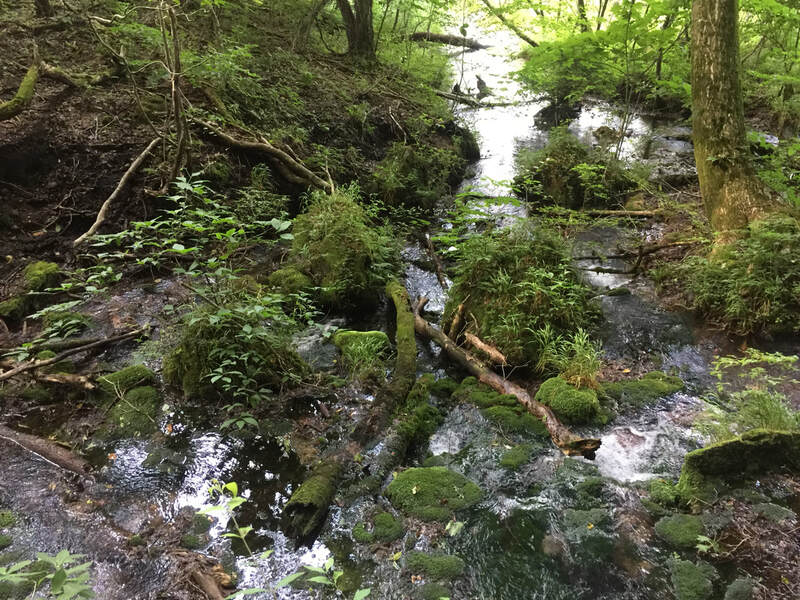 More than a quarter of Oita’s land area is designated as national parkland, and throughout my tour I was amazed by the natural riches of the region. 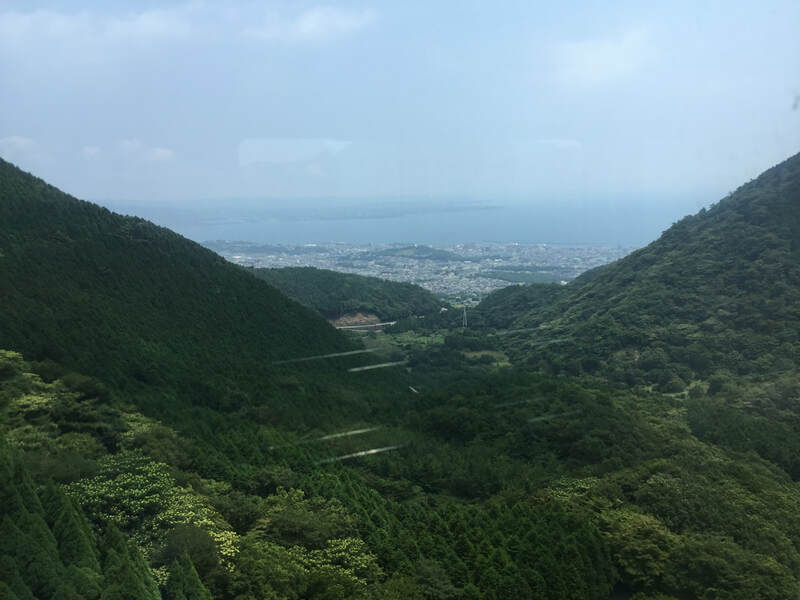 My first nature-excursion was in the outskirts of Beppu, taking a ropeway cable car up Mount Tsurumi and literally into the clouds. The ascent offered spectacular views of Beppu and Oita cities, Mount Yufu and the distant Kuju Mountains. By the time the car had reached the top, however, the peak was swathed in fleecy mist, and the soaring views I had seen on the ride up had become invisible. 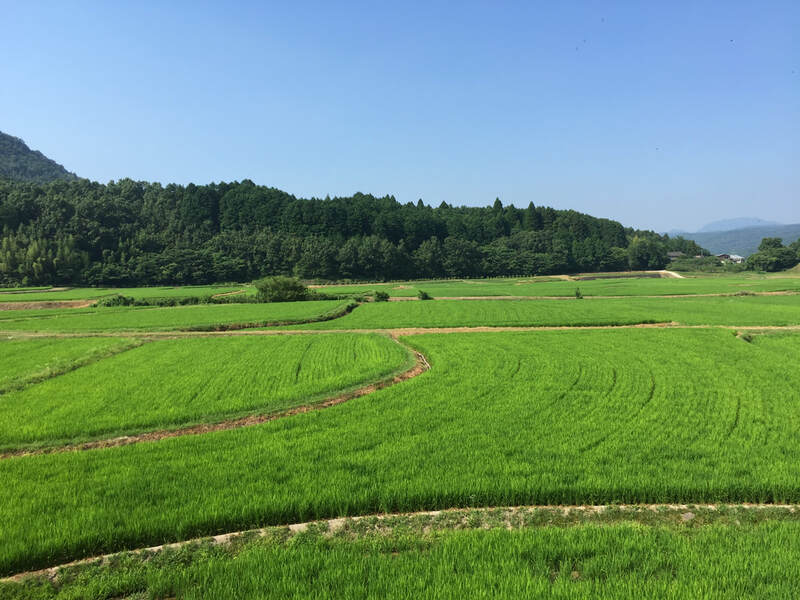 Later that day, I proved that what I had seen in the distance was no illusion, as I drove along the winding Yamanami Highway past emerald rice paddies and highlands into the thickly forested slopes of those same Kuju Mountains. 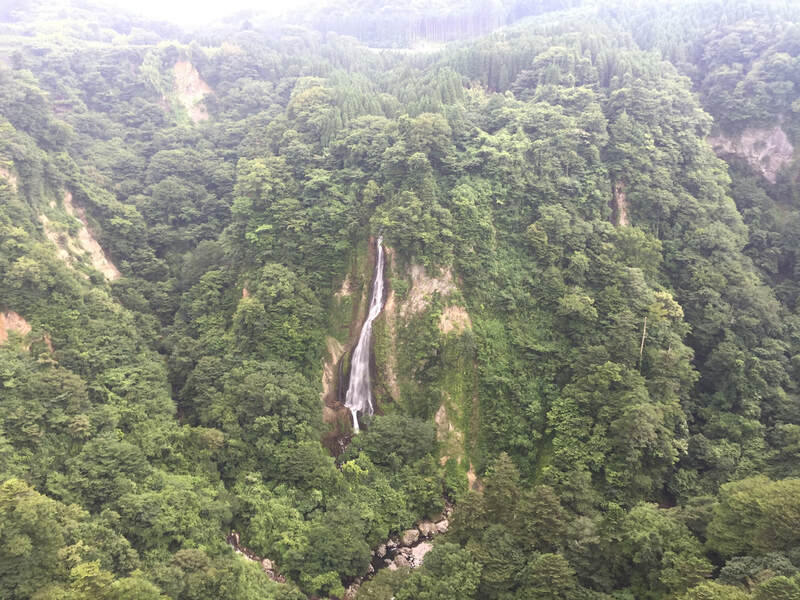 During the drive I stopped to walk across the Kokonoe Yume Suspension Bridge, which affords stomach-flipping, mind-thrilling views of wildly plunging waterfalls threaded among the dense evergreens and gray crags and tangled green, river-laced valleys almost 600 feet below. On succeeding days, I traveled by motorboat across the sparkling Saiki Bay to Fukashima, a laid-back island haven where the cats outnumber the humans. Back on the main island, I drove along the dramatic coastline, through redolent fishing villages, to Hazako Beach and the Hazako Nature Center, where I learned about its ambitious sea turtle conservation project. For those who prefer monkeys to cats, the Takasakiyama Natural Zoology Park in Oita town has more than 3000 wild monkeys. They’re especially frisky at feeding time, when uniformed attendants walk through the grounds dispensing food – and hundreds of simians swoop in from the surrounding forests to gorge on the buffet. The highlight of all these natural riches for me was the rippling, stunningly picturesque rice paddies of the Tashibunoshou World Agricultural Heritage Area, and then an hour-long walk through the verdant wetlands and enchanting forests of the Tadewara Marshland at Chojabaru. This pristine high moor has been recognized in the Ramsar Convention on Wetlands of International Importance as a precious preserve of rare flora and fauna. There was an almost mystical energy in the forest bordering the marshland, a confluence of sparkling streams, glistening rocks, and redolent ferns and pine needles, and I would have liked to spend another hour or two venturing deeper into its heart. Next time! 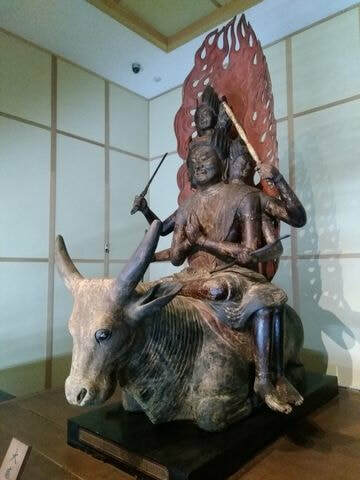 Perhaps the most surprising revelation of my entire trip was the wealth of religious history and art in Oita. 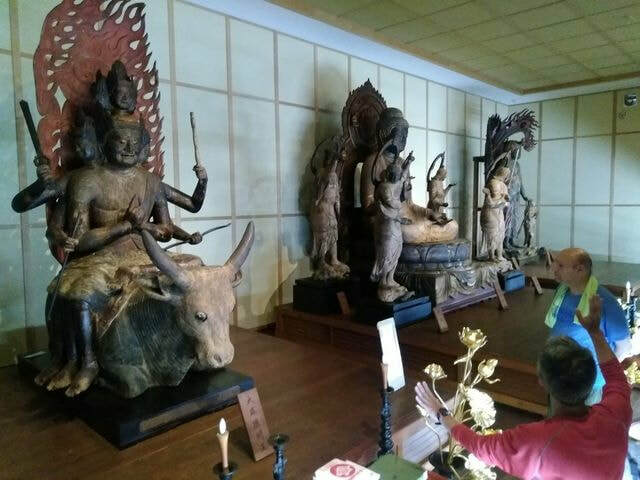 The prefecture is one of the cradles of Japanese culture and spiritual belief, and its significance is evident in the accumulation of religious sites and masterpieces, especially on the northeastern Kunisaki Peninsula. 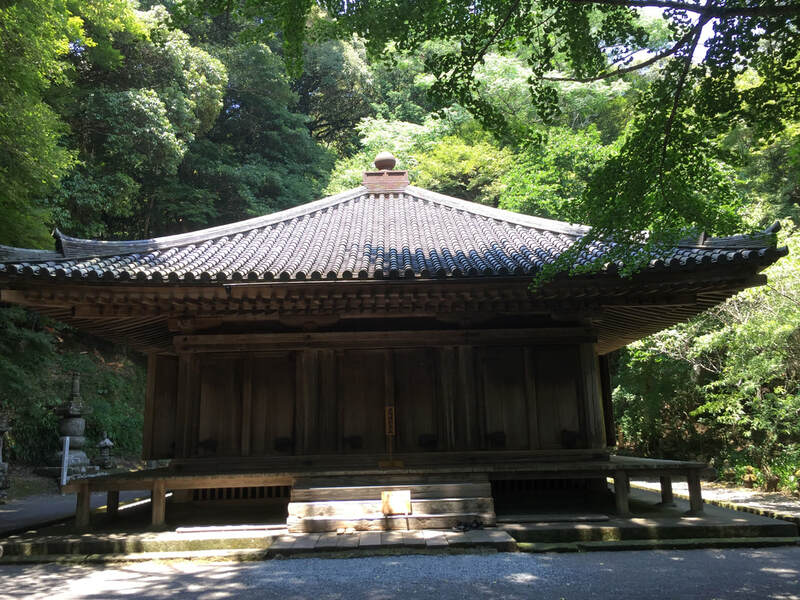 In the 8th century, when Usa Jingu was built, the god Hachimangū was enshrined there. Hachimangu was believed to be the deification of the legendary 3rd century Emperor Ojin, who after his death became known as the god of archery and war and the protector of the Imperial family. Thus, since the 8th century, Usa Jingu has been considered one of the most powerful shrines in Japan. Today there are some 40,000 Hachimangu shrines located throughout the country, and Usa Shrine remains the head of them all. Also in the 8th century, owing to its location near the area where many ships from China and Korea would make their first landfall in Japan, Usa Jingu became a place where foreign monks and merchants would mingle with Shinto priests. Over time this intermingling produced a rich religion called Rokugo Manzan, which combined elements of Shinto, Buddhist, Taoist, and native mountain worship beliefs and practices. According to ancient records, a Buddhist temple called Miroku-ji was built next to Usa Shrine in 779, making it the first shrine-temple in Japan. 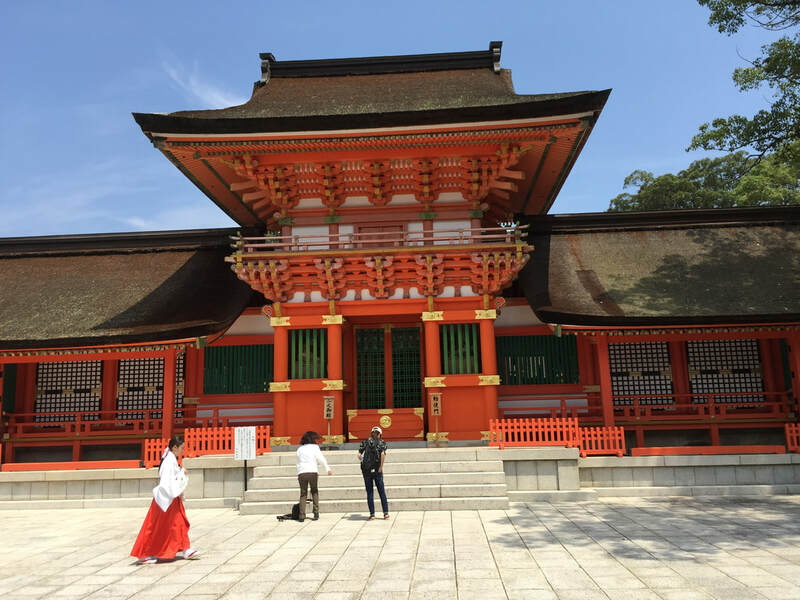 The resulting syncretistic complex, called Usa Hachimangu-ji, or Usa Hachiman Shrine Temple, survived for more than a millennium all the way until the Meiji Restoration in 1868, when Buddhism and Shintoism were effectively separated by a governmental act. As the birthplace of both the warrior-worshipping Hachimangu cult and the culture-shaping Shinto-Buddhist union, Usa Jingu is definitely a power spot. Today’s sprawling compound, rebuilt in the middle of the 19th century, presents a number of striking vermilion buildings as well as impressive groves, gardens, and ponds. But beyond any particular sight or artifact, what struck me was the shrine’s deep history and almost electrically charged atmosphere. As I walked the grounds, I thought: The character of Japan was forged right here. This is a special place that every visitor should see. Thirty minutes away by car, another must-see site is Fukiji Temple. Built in 718, this National Treasure is the oldest wooden building in Kyushu. I found this simple, spare structure to be extraordinarily transporting. 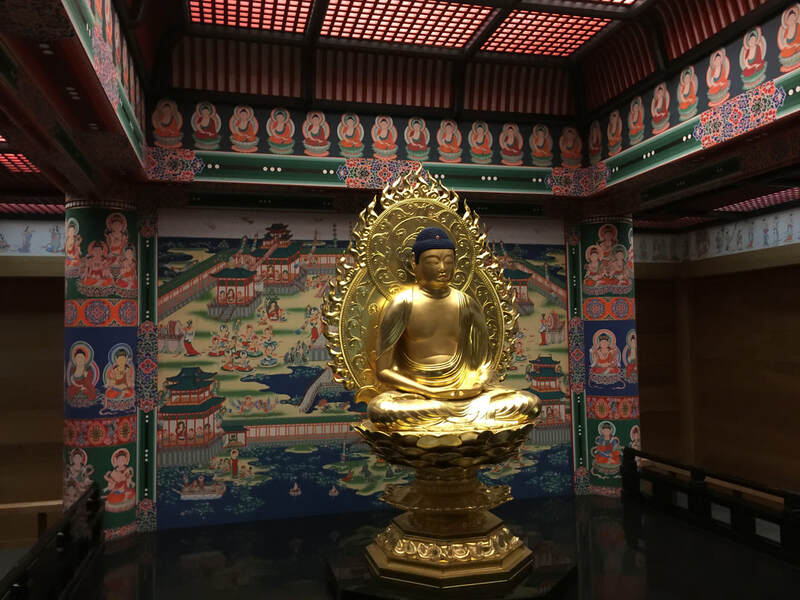 Fukiji is dedicated to Amida Buddha, and its main hall -- ranked as one of the top three Amida Buddha halls in Japan – houses an exquisite wooden, seated Buddha that has been designated an Important Cultural Property. 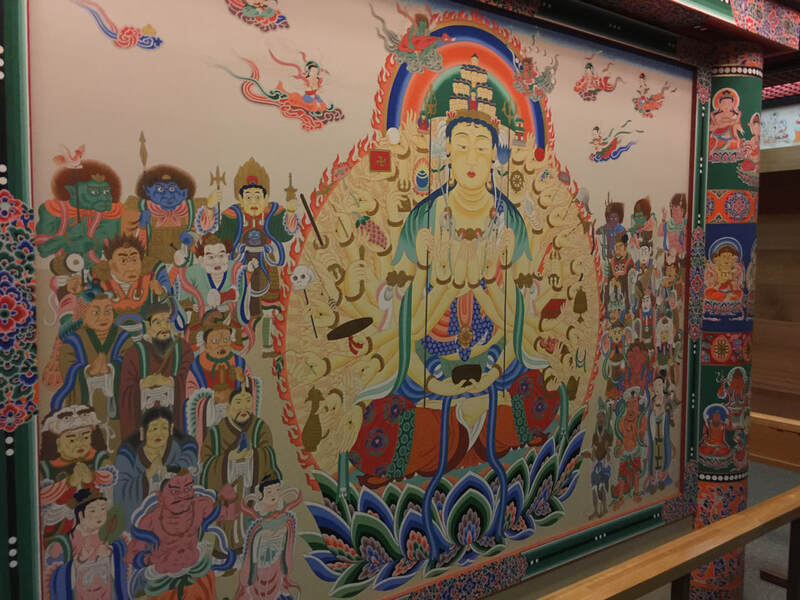 The temple walls also are covered with intricate murals that illustrate various themes from Buddha’s life. Today the temple structure presents a muted, weathered appearance that synchronized smoothly with my modern sense of religious tranquility; but originally, the temple was shockingly colorful. To understand how the buildings and murals looked in the 8th century -- and if you’re like me, to have your 21st-century suppositions turned inside-out and upside-down -- visit the Oita Prefectural Museum of History, which showcases a mind-bending, technicolor, life-size reconstruction of the temple's original main hall. You’ll never be the same. 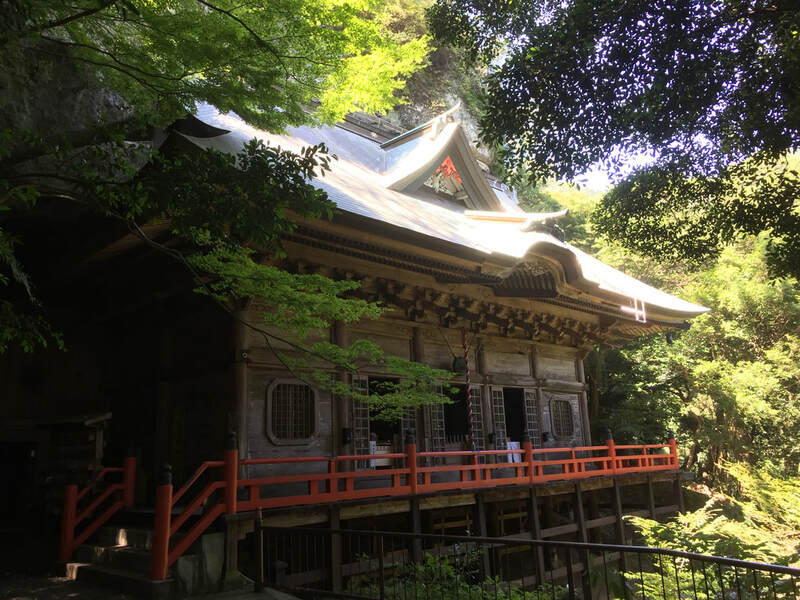 Another must-see temple in this area is Futagoji, whose grounds sprawl over the thickly forested slopes near the peak of Mount Futago, the highest mountain on the peninsula. Remember Rokugo Manzan, the syncretistic religion? That term literally means “Six Districts, Full of Mountains,” and it refers to the six valleys that radiated from Mount Futago. Accordingly, this temple was originally the central temple of the Rokugo Manzan culture. Like Fukiji, Futagoji dates back to the 8th century. An atmospheric, iconic pair of stone Nio guardian statues flank the mossy, stone-stepped approach to the temple. 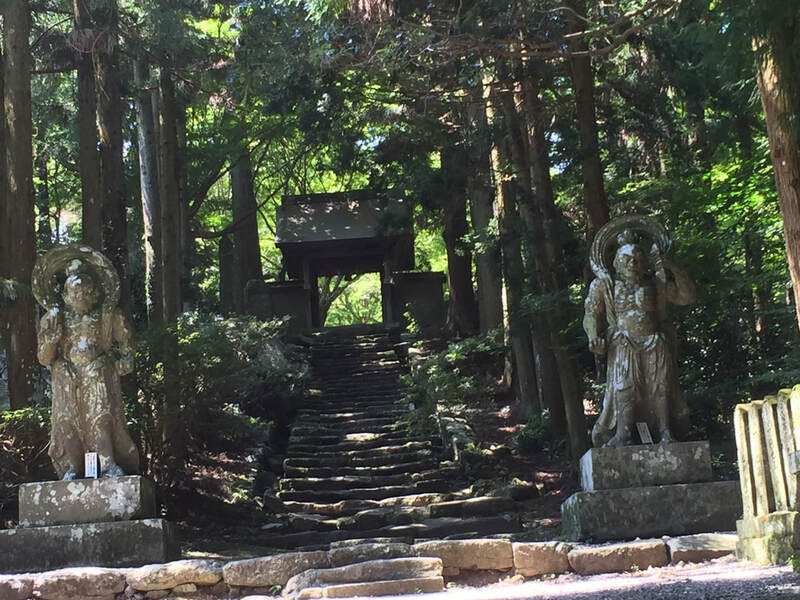 A ten-minute walk leads to the Gomado Hall and beyond that, deep in the trees, to the Okunoin Hall, which enshrines a thousand-armed Kannon Bodhisattva. I found this hall especially mysterious and powerful; set deep in the mountain’s forested heart, it exuded an ancient, pure, sylvan power. 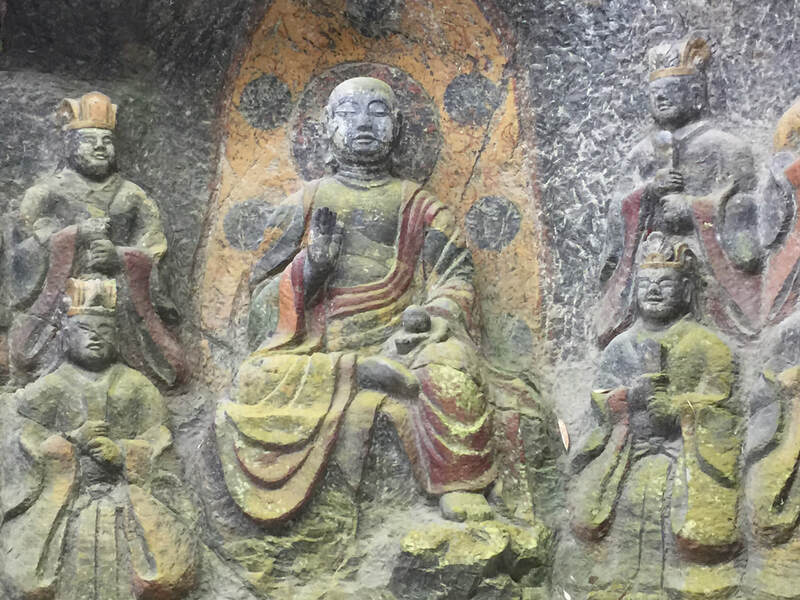 My explorations of the Kunisaki area led to two more examples of the extraordinary Buddhist art and architecture that are found throughout the peninsula. 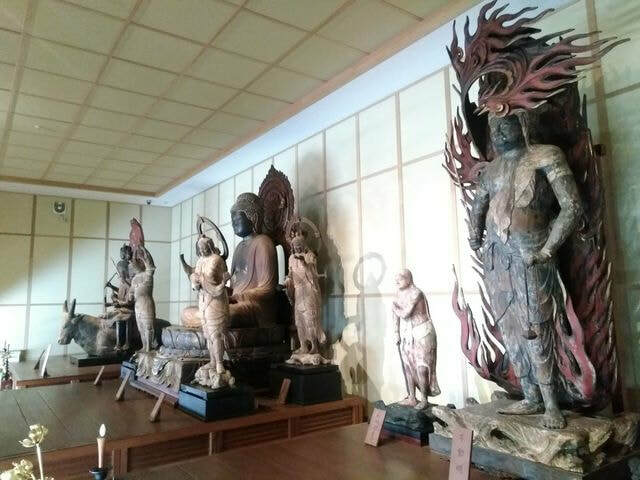 At Maki Odo temple, located just three miles south of Fukiji, an exhibition hall near the reconstructed temple displays nine wooden Buddha statues from the Heian Period of 794-1185; when I saw these, I could hardly believe my eyes. The quality of the work is truly extraordinary; these masterpieces have rightfully been designated as Important Cultural Properties. 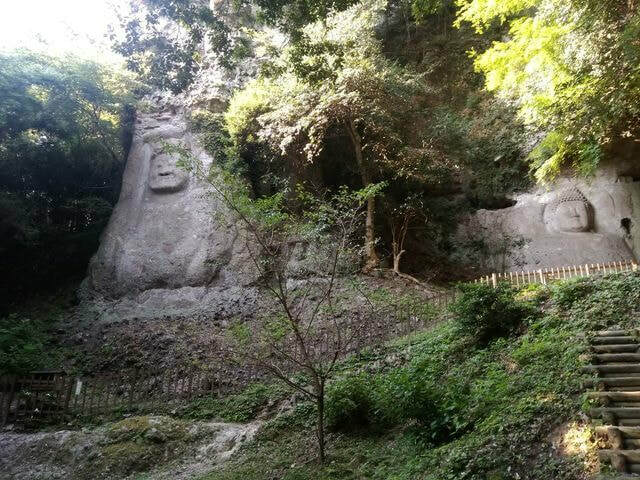 Less than three miles south of Maki Odo are the Kumano Magaibutsu Stone Buddhas, two huge stone carvings set into the walls of a cliff. To reach the carvings, visitors walk on a gravel path through a forest and then up a rugged and steep flight of stone stairs. The total walk takes about a half hour. When you arrive, you’ll see two immense Buddhist reliefs sculpted into the cliffside; the far relief is about 22 feet tall and the near relief about 26 feet high. These are the largest Buddhist stone carvings in Japan and the site is designated an Important Cultural Property. Interestingly, there is a marked difference in sophistication between the two figures. As a locally produced handout charmingly says, “It is assumed that the Dainichi-Nyorai on the right was carved sometime between the 10th and 11th centuries by a professional sculptor invited from the capital city. The Fudo Myo-o on the left may be the work of a monk under training in the 12th century… Since none of these stories have been proven, this place is shrouded in mystery.” It is indeed shrouded in mystery, and standing in the cool, quiet glade, contemplating these venerable expressions of faith, I felt the place was touched with a bit of magic too. On the last day of my stay, I saw one more extraordinary example of these Buddhist treasures, the stone Buddhas at Usuki, Japan’s largest stone Buddha group. 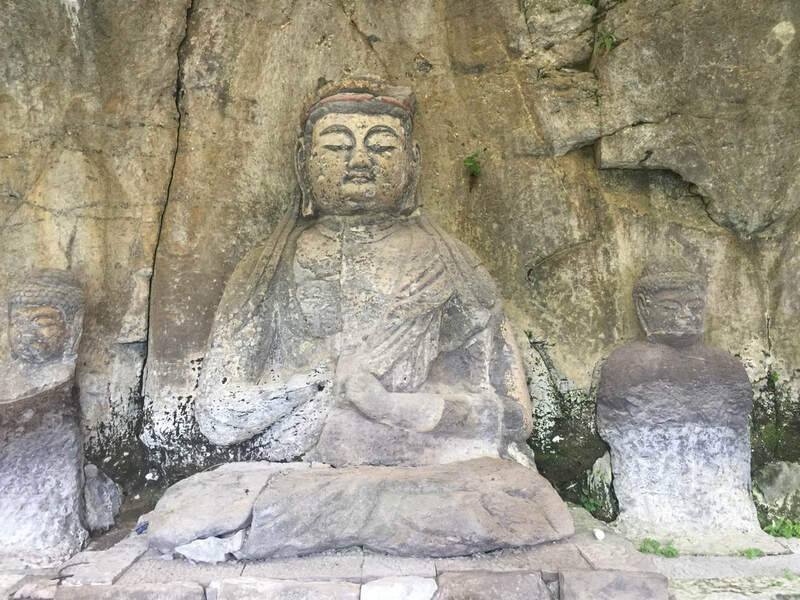 Designated as a National Treasure, these comprise four clusters of 61 statues, sculpted into a cliff about three miles southwest of Usuki city, located on the Inland Sea about an hour and a half south of the Kumano Magaibutsu Stone Buddhas. The four clusters are connected by a paved trail, and it takes about 30 minutes to see them all. Because they are carved from highly workable, soft, volcanic rock from nearby Mount Aso, these works are much more intricate and detailed than the Kumano Magaibutsu Buddhas. The figures are believed to have been carved in the 12th and 13th centuries, but scholars still have no idea who carved them or why. Yet these figures exert an irresistible pull on the viewer. Or at least they did on me. Rich in detail, and colored with still-visible streaks of orange and red, they seemed to speak through the ages, testaments to the fervent faith that has emerged and evolved for centuries throughout this resonant region. WEEKDAY WANDERLUST IS JAN 11! I BEGIN TEACHING MY GRAD SCHOOL NONFICTION WRITING WORKSHOP AT SAN JOSE STATE JAN 24!! AND MY BOOK PASSAGE TRAVEL WRITING WORKSHOP STARTS JAN 30!!! What an ALL-CAPS way to start the year!!!! I look forward to toasting 2018 with you at the Hotel Mystic on Jan 11!!!!! I'm honored and thrilled to be editing BBC Travel's Words & Wanderlust column, which is dedicated to publishing long-form narratives that illustrate the transformational power of travel. I welcome story ideas for the column. Before submitting an idea to me, please read the Author Guidelines below. Thank you -- and happy travels! BBC Travel is an editorial section within BBC.com that provides inspiring and high quality content on destinations around the world. It is fuelled by regular, relevant and inspiring editorial content from a global community of editors and authors who provide a trusted perspective on the world of travel. We are independent, impartial and honest. Our goal is to publish strong, engaging, entertaining content that reaches the gold standard the BBC is known for. 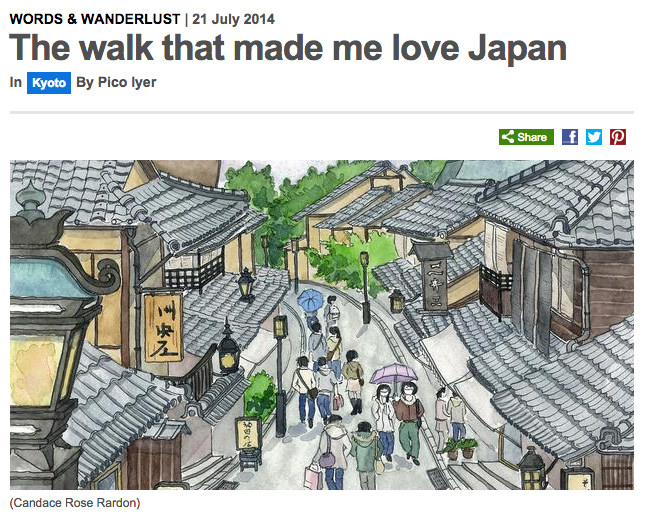 What is the Words & Wanderlust column? Our travel memories are woven from the places, people and experiences that elevate the commonplace to the unforgettable. Our new travel writing column, launched in July 2014, is a creative space to reflect upon these memories, while also inspiring new ones. The series serves as a platform to showcase the kind of exceptional long-form travel writing that we believe is lacking online. We want to publish stories that illuminate the experience of travelling and conjure a sense of place vivid enough to make our readers fall back in love with the world. 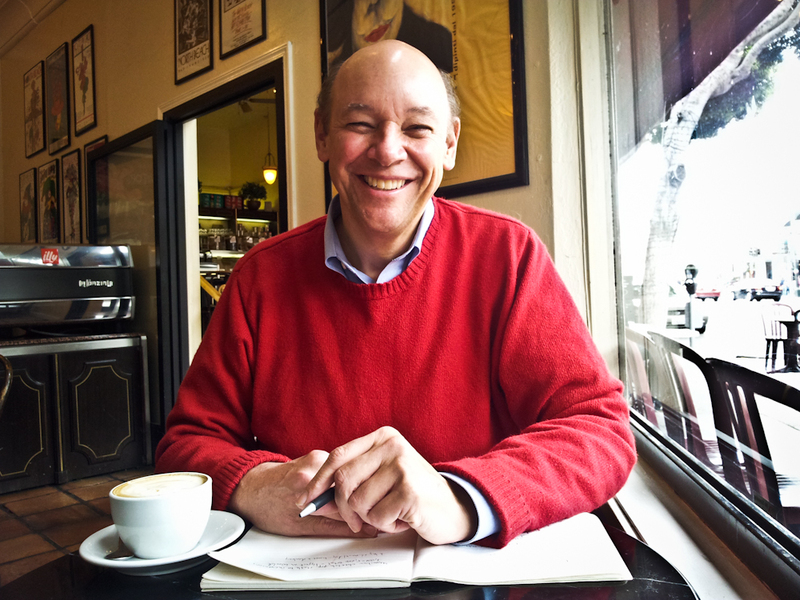 The column – which is updated monthly – is edited by Don George and lives here on our site: http://www.bbc.com/travel/columns/words-and-wanderlust. We are looking for travel stories that are poignant, fascinating, funny, moving, engaging, heartbreaking, eloquent, inspiring and/or surprising. Above all, they should demonstrate a passion for travel and an engagement with place. We want unique and compelling pieces that take storytelling to the level of high quality, long-form narrative writing, bringing travel to life with all the flair of fiction. Essentially, we are looking for a variety of exceptional travel stories that shed light on a particular destination and evoke a human experience in a way that illuminates the larger journey we share. BBC Travel will likely reject stories that do not tell a unique story or are not written to our standards. Creativity is encouraged, though fiction, including poetry, is not allowed. Be aware that we will only accept pieces with really interesting narratives behind them – climbing a mountain may be an impressive feat, but it won’t necessarily make a strong narrative that will resonate with a reader. The author’s voice should be engaging, inspiring and entertaining. Writing should be aimed at a universal audience who are passionate about travel, curious about people and places and want to engage with the world around them. Though we want unique stories, the piece does not necessarily have to be written from a first-person perspective (though it certainly can be! ); a successful narrative might be character-driven, about another person’s travel experience, or a more conceptual essay ruminating on the experience of travel in a broader (but still focused) sense. Above all, the tone should conjure an authentic sense of connection to the destination visited, include evocative descriptions of a destination’s people, atmosphere and environment, and a sense of delight in the experiences and destinations described. Your story should be between 2,000 and 3,500 words, depending on the complexity of the piece. Please send Don George (don.george@sbcglobal.net) a short synopsis (about 200-350 words), explaining the topic/theme/angle and why you think it would work on the site. The synopsis should also give us a taste of your writing style and ability to engage the reader. Please also send a short description (maximum 75 words) of your writing experience and links to other published pieces. Unless otherwise confirmed by Don George in advance, all commissions will be on spec only and we reserve the right to turn down a piece once the full copy is submitted if it does not meet our standards. It is BBC policy to give every piece of content at least two edits. Please let us know if you’ll be off the grid for some time and unavailable for edits. Fee to be confirmed directly with Don George. Once your story is commissioned (or accepted, in the case of a story submitted on speculation), you will receive an email containing BBC payment forms. Please fill those out and return them as soon as possible, as the initial payment processing for new writers can take some time.